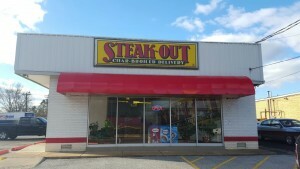 Steak-Out has been proudly delivering top quality food and service to the Swansea, IL area for over two decades. From steaks to chicken and seafood, we grill our meats over an open flame and season them with our very own secret sauce for a flavor that’s irresistible. No matter what meal this Swansea steak restaurant serves up, know it will be delivered directly to your door fresh and hot every time. We want you to enjoy a delicious quality meal, so call or place an order online to savor the sizzle.